Not all days go as planned. In fact, most of them probably won’t. We fill our plates with too much to do and then worry about not getting it all done. Busy work-lives, family obligations, social activities, and keeping up appearances on social media puts a lot of pressure on our day-to-day lives – and piles on the stress. We all know the dangers of stress and the tell-tale signs of being too stressed out. Losing sleep, feeling anxious or depressed, new aches and pains, irritability, and poor memory can often be signs that we are letting stress run our lives a little too hard. But do you know how to check your stress right in the moment that it starts building up? How to recognize it and nip it in the bud? Some of the early signs that we are headed down a stress-rollercoaster are increased heart rate, shorter breaths, racing mind, nausea or loss of appetite, or dull headaches. If you find yourself moving down this road, it’s time to stop, drop, and do yoga. Yoga is one of the quickest and easiest stress-relief techniques. It pulls you into movement and breath, clarity and focus, and realigns you with your balance and strength. In times of need, yoga can be the rock we return to to help us regain our power and release the overwhelm of our stressful lives. 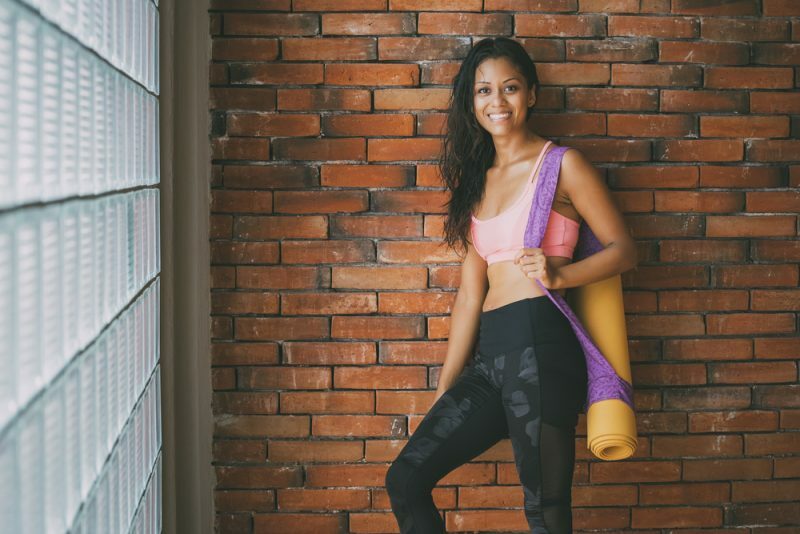 The truth is, however, few of us have the flexibility to jump into a yoga class or dedicate an hour or more per day to reap all of these wonderful benefits. Not to worry – even a few minutes of simple yoga can snap you out of a stress-induced haze and put you back on track for the rest of your day. Fifteen minutes can make a major difference, so set aside a little break, jump into this fifteen-minute stress-relief sequence, and refocus! The Standing Side-Body Stretch can do so much for such little effort. It stimulates your spine and nervous system and helps you practice the flexibility you need to get through tough times. This pose helps you feel grounded, while also pumping blood and oxygen through the body to reverse the effects of stress. Begin standing, tall and straight as in mountain pose. Place your right palm along your right hip. Raise the left arm up overhead and bend towards the right side while gazing up at your hand. Rest here, stretching your left side and breathing deep, full, fluid breaths. Slowly raise back up to your seated position and repeat on the opposite side. Crescent lunges are great for a quick brain-reboot. Stretch your legs and reconnect to your balance and focus. This pose helps you to feel strong and confident so you can take that feeling back into the rest of your day. This pose can be done either resting in lunge on each side for a series of 8-10 breaths, or jump back and forth, alternating the lunges to release tension and shake things up. Start in Downward Dog, then step your right foot up between your hands. On an inhale, raise your chest up and bring your arms up overhead. Drop your shoulder blades down and look up to your thumbs. Rest here or switch sides by exhaling, swinging the arms back down your sides, switching your leg placement. After finding balance in Crescent Lunge, we will move on to Revolved Side-Angle to really focus on our breath and stability. From your Crescent Lunge, return to the position with your right knee forward. Place your hands in prayer position at the heart, then rotate so that your right elbow rests on the inside of the right knee. Look up and breathe here for 5 to 10 breaths. Sometimes a stressful situation calls for a little change in perspective. 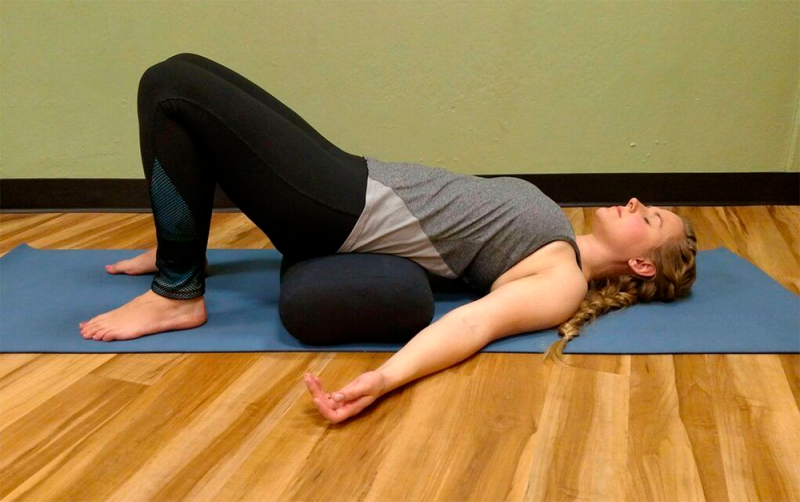 Wide-Leg Forward Fold helps us to release and refresh our brains. With our heads to the floor, we invigorate our minds with nourishing blood flow, oxygenation, and vitality. This is a great pose to take when you’re ruminating on a difficult problem, need to discover a new solution, or are having a conflict with another person. Return to a standing position, then move your legs out to slightly wider than hip-width apart. Breathe in and lift your arms up overhead, with fingers pointed towards the sky. On an exhale, slowly bend forward to bring your chin to your chest and arms down to touch your feet with your head gentle hanging downwards. Rest here for 10 breaths. If needed, inhale, raise your arms overhead, and repeat the process. This next pose works to open and release the chest and back. Many of us hold stress and tension in our low backs, upper backs, and chest area. We tense up under pressure and this supported Bridge pose helps to open and inviolate these areas, allowing for free flow of blood and energy and a breath of fresh air. For this pose, you’ll need to grab a block, blanket, or pillow if you have one handy. If not, take it easy on this one and don’t overdo it. Lie on your back, bend your knees, and place your feet firmly on the ground. Bring them as close to your sitting bones as possible. Bend your elbows to place your palms on the ground behind your shoulders with the fingers pointing back towards the shoulder joint. Exhale and lift the tailbone and rest your prop underneath your sacrum or low back. Allow your chest to open as you sink into the pose, taking 10 breaths or more here. Cat-Cow pose is up next, and will continue to help us find flexibility, open up, and release. Cat-Cow flushes the body of toxins, improves our flexibility, and opens our chests. When’s tressed, its natural to cave into ourselves, hunch our back and break off connection with the world around us. Cat-Cow invites us to reopen, reconnect, and renew. Move from bridge pose to your hand and knees, with knees hip width apart. Place your palms firmly on the ground beneath your shoulders to come to a tabletop position. Exhale slowly and fully, and roll your back to the sky, tuck your chin to your chest to come to cat. Inhale slowly and arch your back, bringing your navel to the ground, lift the head high to look at the sky. Repeat this sequence slowly 5-10 times. Puppy pose is an excellent way to find grounding and relaxation. It’s a blend between invigorating Downward Dog and centering Child’s pose. While we are using it within our sequence, you can retreat to this pose anytime you need a mental time-out. Return to a neutral tabletop pose and begin to walk your hands out in front of you as you lower your chest to the ground. Continue until you can comfortably rest your forehead on the ground in front of you. Keep your hands and arms engaged and your hips over your knees. Rest into the position with easy, deep breaths for 2 minutes. Who doesn’t love Savasana for stress-relief? We often close our sessions with a brief rest in corpse pose, but for added stress relieving power, try your Savasana with Legs Up the Wall. By placing your legs vertically along the wall next to you, you are encouraging added blow flow to the brain and nervous system, while nourishing and supporting the whole body. Sit on the floor near a wall and swing your legs up to rest on the wall. Push your buttocks close to the wall so that you and lay back so your back is resting on the floor. From here, your legs can either rest straight up or in a relaxed ‘V’ position. Let your arms rest by your sides, on top of your lower belly, or over your heart. We’ve allotted two minutes for this pose, but rest longer if you have the time. Stress is a fact of life, but we can change how we process it. One of the best ways to reduce the negative effects of stress is to nip it in the bud when we notice the first signs of our reaction. Real trouble starts when we allow stress to overrun our lives and take hostage of our bodies and brains. Why stew in your stress when a quick yoga sequence can break you free? When times are tough, it can seem even more difficult to find time for yourself. Even fifteen minutes can seem impossible, but I encourage you to find a way. If stress often hits you in inconvenient situations that don’t allow for this full sequence, see if you can find a way to practice even just one of these poses when the stress ramps up. Then, carve out fifteen minutes before bed or upon waking to get the full benefits of this stress-relieving yoga session.